Off-site Content–good, bad, or ugly? Seriously. It's right under the picture of Lady Ga-Ga chihuahua. Publishing off-site content is one of the most frequently mentioned SEO tricks. Of all the ways to gather topical, relevant backlinks, off-site content has a lot going for it—you can have control of substance, link text, and to some degree, placement. Or not. Depending on the content publisher. Still, it’s totally worth it, right? We’ve mentioned the strategy a few times before (here’s one in case you’ve forgotten 10 Step SEO # 6: External links (part b). All-in-all, we’d have to say that off-site content can be a very useful tool, particularly in long-term SEO campaigns. Still, there’s some things you should consider. Are links in the published content “no-follow”? How long will the content stay up? Does the content publisher allow other sites to duplicate their content? Does the publisher allow contextual links? Or just a link or two in the bio/attribution blurb? Do they publish other articles or content on the same general topic as yours? How long has the publication site been active? Do their internal pages have any PageRank? If it’s a blog or forum, do they archive? Is off-site publication the best use of this content? Because if you’re writing 300 word articles just to gain a link or two on a no-PR page, that stuff might do more for you as a new page of content on your own site. Think about it. You know you need content. Lots and lots of content. And it must be good content, quality content. Current content, fresh content, unique content. Thus hast the Panda spoken. Okay, so you write a few pieces for the blog and maybe an article or two. You con your co-workers into contributing a paragraph or two. You get your teenage relatives to write about stuff they could not possible care any less about. And that works for about a month, but then you’ve reached the limits. Out of ideas. Out of time. Out of patience. What’s a webmeister to do? Outsource it, of course! Which can be great. Particularly in these tough economic times where unemployed English majors outnumber the working ones (unless you count part-time Burger King jobs). Writers are a dime a dozen and they will fight each other in the streets for one $40 assignment. Good choice, now what? Well, you can rely on your contacts to get word-of-mouth recommendations (probably the best way to get quality writers), or advertise on Craigslist or similar, or go to the web where freelance “dating” sites flourish. Elance is perhaps the oldest, but trust us, there are many. If you decide to go with an unknown writing resource, some care should be taken to be sure you’re getting that quality content you crave and at the same time getting a decent return on your money. Here are five things you should check. Online writing samples. Look for writing samples that are actually published online somewhere. Web writing is different from any other, for one thing, for another, online samples are easier to test for originality and freshness. Originality. Verify that the work you are getting is original to you. Use a plagiarism checker. Here’s a free one: plagiarism checker. Ratings or reviews. But don’t just trust the ones posted on the freelancing sites. Look deeper into who’s reviewing them and what the writer wrote for them. Topic qualifications. True, many professional writers can do a great job on virtually any topic. Still—especially if your topic is technical or highly specialized—you will get better content if the writer has some topic familiarity, either through education, avocation, or experience. Experience at freelancing. Sure, everybody has to start somewhere. But you probably will have a better experience if you hire someone who knows about deadlines, grammar, research, and etcetera. Rel = “author” = Whaaaaat? 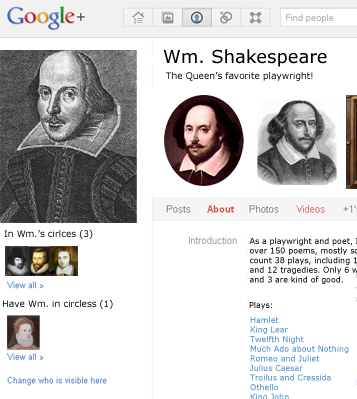 Shakespeare's Google Profile--Will the rel="Author" tag help him with his keyword ranks? With us so far? No? Okay, again only slower. The idea is this: people who write content for the web typically end up published all over—in articles, in blogs, in interviews, and reviews, and stories, and reports, and on ad infinitum. To a spider, all these bits of content have no connection. They are all just disparate bits of content. Yet, they may have all been written by somebody with some specialized knowledge, skill, or connections who might actually be more credible than other writers tackling the same subjects. Connecting all these pieces of writing under a single author could be used to determine that author’s authority, her publication history, her general appeal, and even her topics of expertise. Which could then be used to help Google determine the content’s value. Quality content (or so we have heard) is just what Google loves best. Here’s how it works, hands-on. Every time you write content for the web, you include a link somewhere (anywhere) on the page. It can be an image or a phrase, in the by-line or the body or the bio. This link points to your Google Profile page. (You do have Google Profile, don’t you?) Inside the link, you add this attribute: rel=”author”. Then, on your Profile page, you put a link pointing back to the page that contains your author tag. And the content is now credited to you. Then again, we think it’s about time the poor, under-appreciated content professionals got their props. A few years ago, SEOs were introduced to a new concept that shook a lot of trees. Wired magazine published an article by Chris Anderson in October 2004 that popularized the idea that instead of targeting high-traffic, high-competition keywords, there was money to be made by targeting a host of keywords that have little traffic potential. There is a lovely graphic everyone shows to prove the theory. SEOs loved the idea. Mostly because long tail keywords are doable. We might never be able to break page 1 for “mp3 player,” but we sure as hell can get you on top for “big frickin pink sony walkman mp3 player loaded with stolen music.” Number 1, baby. And if we promise to do that for, like, 8 million similarly impressive long tail terms, you’ll do really really well! Yes, lower competition keywords are desirable. Yes, 100 one-visit a day keywords are equal to one 100 visits a day keyword. But no, because the vast majority of long tail keywords are zero visits per day keywords. So what we’re really looking for is the “green zone” keyword. Let’s talk about that mythical beast. The “green zone” keyword is the one in the sweet spot. It is far enough inside the tail that you might be able to get some traction, but yet, still is capable of driving some traffic. Doe you like me? Do you really, really like me? Does social media have an SEO value? The answer makes a difference. If a company’s social media efforts adds value to the SEO campaign as well as deliver at least some direct revenue generation, well, maybe that’s enough to justify transferring the budget. Meh. Depends on who you ask. Whenever something new-ish comes along to capture the hearts of MarCom execs everywhere, a circus-ful of promoters and cheerleaders quickly develops. Happened with banner advertising, happened with pay-for-placement, happened with rich media, and now it’s happening with social media. Google “SEO value of social media” and you’ll get a hella lot of “yes” votes, mostly from companies and consultants trying to get you to buy their social media package. But there are also some “not-so-sure” votes and even some “noes.” What are the facts and what are the spins? All the major social media venues (re Facebook, Twitter, Digg, et al) only publish links with “no-follow” tags. Meaning links you post in FB, Twitter, etc, do not directly count as links for page authority. At least two of the majors, FB and Twitter, suggest that they do count social popularity indicators when they figure page authority. (See this SEOMoz post for specifics.) Although whether or not these ranking elements count as high as, say, link authority is very much up for speculation. Social media titans desperately want your advertising dollars. Facebook, for instance, is flirting with an IPO early next year—and if they rake a billion dollars profit from advertising this year (Business Week), it will surely have an “upward influence” on their valuation. Meaning that they (and the other social media venues) have a serious vested interest in convincing folks that their products add value. Because the actual ranking value of tweets, retweets, twits, and twattle is complete speculation, declaring that “there is an SEO value to social media” at this point is a lot more like a mantra ( I do believe in ghosts, I do, I do, I do) than a solid reason to throw the weight of marketing budget into it. Because advertising firms are competitive and always trying to come up with new ways to attract advertising dollars, they will always jump on any hype-wagon that rolls into town. Social media happens to be a big ‘un. So believe all the “well, even if there isn’t any measurable ROI, at least it’s good for SEO” chatter you want. Just make sure you’re carrying a very large hunk of salt. So. The ultimate answer to our original question then is clear. Yes, there is probably at least some SEO value to social media marketing. No, it’s probably not enough value to justify short-changing your SEO budget.